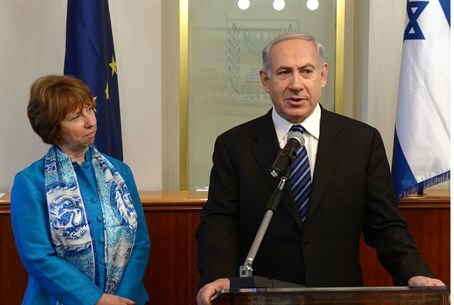 PM Binyamin Netanyahu told EU chief Catherine Ashton in Jerusalem that elections did not change the Iranian nuclear threat to the world. Prime Minister Binyamin Netanyahu told European Union foreign policy chief Catherine Ashton in Jerusalem that recent elections did not change the Iranian nuclear threat to the world. "The elections in Iran will be tested by whether Iran changes its policies and stops all enrichment, takes out the nuclear material and shuts down the illicit nuclear facility in Qom," Netanyahu said at the start of the meeting Thursday between the two leaders. "These are Security Council resolutions. Their feet should be held to the fire," he said. "It’s not a question of style, but substance," he added, clearly referring to Iran’s newly-elected President Hassan Rouhani. "It’s not a question of political spin, but the spinning of centrifuges. That has to stop, and I think that it is important that Europe joins the United States and Israel and all responsible elements of the international community, and demand a cessation of the Iranian nuclear program." The second point in the discussion Netanyahu planned for his meeting with Ashton – one that he said would encompass the issues of "peace and security: – related to the Hizbullah terrorist organization, Iran’s protégé in Lebanon. "I hope that those in Europe who refuse to designate Hizbullah as a terrorist organization will change their mind, and I hope there will be a European consensus on this," the prime minister said. "I mean, it’s hard to see how you cannot have a consensus on Hizbullah as a terrorist organization. "If Hizbullah isn’t a terrorist organization, I don’t what is a terrorist organization," he said pointedly. "I mean, they’re butchering people left and right across the world and now in the cities of Syria. They’re murdering civilians without letup, including on European soil, as was discovered in Bulgaria, as they try to do in Cyprus. "So I would say the designation of Iran’s proxy Hizbullah as a terrorist organization is our second hope that Europe would do, and it would do the right thing," Netanyahu said. "And the third is the right thing by peace. Secretary Kerry is undertaking an effort to resume direct negotiations without preconditions between the parties. That’s the right thing to do," he said. "Israel is ready to resume these talks without preconditions today, yesterday and tomorrow." In response, the EU foreign policy chief expressed her "full support" of Kerry’s efforts. "It is, as you rightly indicate, the way forward," Ashton said. She added Israel’s security was "vital" and that it played a "big part in the approach that we take to these efforts that are going forward," but was tight-lipped about details. "Prime Minister, we have much to talk about," Ashton continued. "I know how important it is to have the chance to consult with you about the situation after the elections in Iran," she said. "I’m privileged to lead the negotiations in our twin-track approach. "I also recognize that it’s important that we consult with those who have a deep interest in this and that we have a chance to think about the broader region on the questions that concern us all and I hear what you say, especially on your concerns about what’s happening with Hizbullah. And we will talk about these things," she added.